Hungry Girl Book-Signing Event… This Saturday (3/23) in Los Angeles! Come celebrate the new Simply 6 cookbook with Lisa Lillien… HG staffers will be on hand, as well as Lisa’s adorable pup, Lolly! No purchase is necessary to attend, and Lisa will take selfies with fans, answer Qs, and sign all HG books! She’ll also be giving everyone awesome goodie bags LOADED with tons of free Hungry-Girl-approved snacks... and raffling off awesome prizes! It’s all happening at 2pm at the Barnes & Noble at The Grove. Click here to RSVP on Facebook. (Optional, but encouraged.) Hope to see you there! Swap dressing for salsa. This is one of my favorite ways to order a restaurant salad. Salsa is so flavorful, and it can save you HUNDREDS of calories when you replace salad dressing with it. 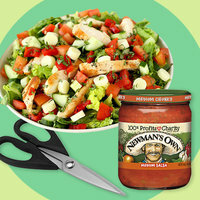 I use salsa on my salads at home too! Dip, don’t pour. If you do want dressing, stick with a light one. Newman’s Own Sesame Ginger and Bolthouse Farms Salsa Ranch ROCK. But don’t just pour the stuff all over your greens. Instead, dip your fork into the dressing. You’ll use way less dressing this way. Even light dressing can add lots of calories if you use too much of it. So DDP: Dip, don’t pour! Chop, chop! I LOVE chopped salads. All the flavors get evenly dispersed, so there’s less need for dressing. Request your salad chopped when you’re dining out, or DIY at home. There are lots of fancy salad-chopping gadgets, but I find a good set of kitchen shears works best! Rinse and eat. If you buy premade coleslaw or pasta salad, give it a quick rinse to send fatty calories down the drain. The flavor will have already soaked in, so it’ll still taste great! Scoop it. Can’t resist that bagel platter? No need to! Just scoop out the insides to save calories and carbs. Bonus: More room for yummy toppings, like smoked salmon, tomato, and capers! Go breadless. Don’t knock it ‘til you try it! Have your sandwich or burger on a lettuce bun… You can even order them this way at a lot of restaurants and fast-food joints! Crisp, crunchy, and low in calories. The PB pour. 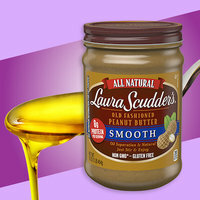 You know that layer of oil sitting at the top of a fresh jar of natural peanut butter? Pour it off! You’ll save 120 calories for every tablespoon of oil, and don’t worry… You’ll still get plenty of those healthy fats. Another trick: Whip up a PB spread with powdered peanut butter, and go half and half with the real stuff. Blot it while it’s hot. I’m talking about PIZZA. Blot your slice with a paper towel… Every teaspoon of oil you soak up saves you about 40 calories. Another pizza tip: Embrace veggie toppings like onions, peppers, and mushrooms, but watch out for eggplant… It’s typically fried and greasy. P.S. 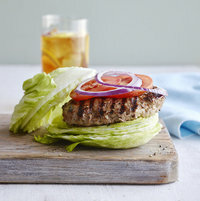 Check out my Hack the Menu list for NINE awesome ways to save calories when dining out. You know someone who could use this info… Click “Send to a Friend” to share!